The third type of Roller coaster is the Micro K'NEX Roller Coaster. 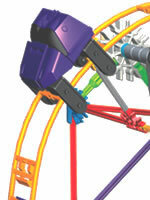 This is the type of Roller coaster provided in all current K'NEX retail sets. The Roller uses special Micro K'NEX Coaster cars, running on lengths of flexible plastic track, as shown in the photo. This track can easily can easily be bent and twisted to form any design of roller coaster. Micro Coaster cars are available in a range of colours to run on this track. You can view some examples of Micro K'NEX roller coaster models if you wish, or Click here to download the Instruction book for a recent Micro K'NEX roller coaster, the Super Cyclone coaster (.PDF file 7Mb). The track can be attached directly to most Micro K'NEX connectors, such as the purple 2-way straight connector shown in the photo. The photo also shows a Micro K'NEX chain guide attached to the track. The guide helps to ensure that any Micro K'NEX chain used to raise the car to the top of the track runs centrally along that track. 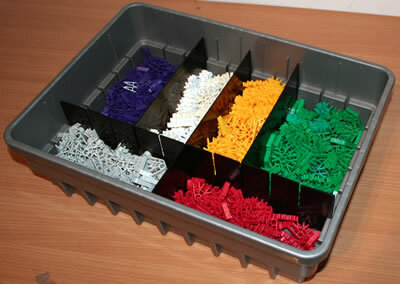 Over the last 5 years, Micro K'NEX Coaster track has been supplied in two non-compatible versions, each in a range of similar colours. The current version, shown opposite in orange, has plastic lugs on one end of each track length, and corresponding slots on the other end. Older versions of the track, shown opposite in green, have metal pins on one end of each track length, and corresponding holes on the other end. 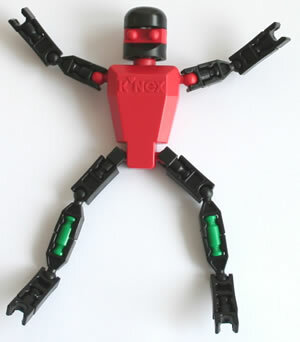 Please bear this difference in mind if you are looking to buy extra lengths of track in our K'NEX shop. Many K'NEX roller coaster sets include lengths of curved track, as shown in the photo. The "Curve left" track length, which incorporates a small circle with a "1" embossed on it. The "Curve right" track length, which incorporates a small square with a "2" embossed on it. Please also note that it is possible to join together two or more Micro K'NEX Coaster cars to run on the track, by attaching the Micro Coaster car link shown in the photo to the front and back of each successive car. The Air-propelled coaster car (see photo) also runs on the above track. 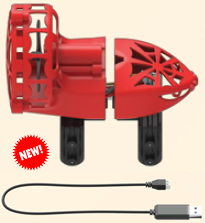 This car includes a motor, a propeller, and a battery that can be recharged via the USB cable supplied. As the car is self-propelled, it can run in any direction, and along a track of any length. 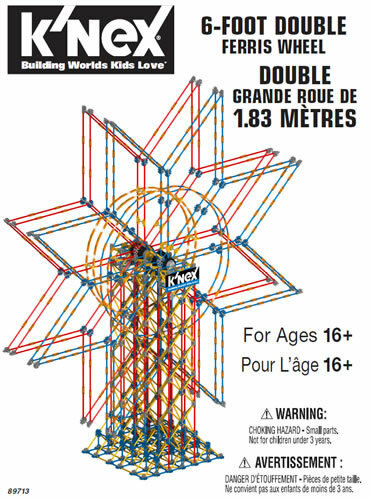 Guidance for its use may be obtained by visiting the knex.com Instructions page, entering building set code 45717, and then downloading the instruction book for the Web Weaver roller coaster set. Some Micro K'NEX roller coasters, such as the Infinite Journey coaster, use a rubber band powered launcher to send a coaster car whizzing round the track. The launcher clips onto the track, and a rubber band is then attached to it at the back. The coaster car may be pulled backwards behind the launcher to tension the rubber band, as shown in the photo, before being released. You may need to hold the roller coaster model steady with your other hand whilst you pull back the car.